The first three items have been tedious. The fourth has been glorious. Keste and Olio Pizza e Piu: Neopolitan-style pizza with a delicious chewy crust. Olio is slightly less delicious than Keste, but is 0.3 miles closer to our apartment. 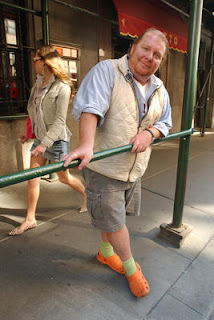 It's always a trade-off, and it often depends on whether Dave is wearing flip flops or hiking boots. Johns Pizza: This will be our last meal in the US. Enough said. (The fact that we have a groupon there that we need to use also works in its favor). Ray's Pizza: By the slice, the 11st St and 6th Ave location is best enjoyed after 2am. Pepperoni, extra hot, no extra cheese, cut in half (for sharing = extra healthiness). 2. 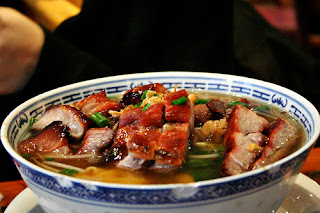 Sammy's Noodle Shop. The roast pork wonton noodle soup is a Sunday night staple; the enormous eggroll is a rare and delicious treat. 3. 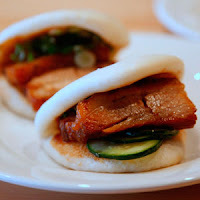 Momofuku Pork Buns. Again, only an internet photo here, since we were too busy stuffing our faces to capture the moment. 4. 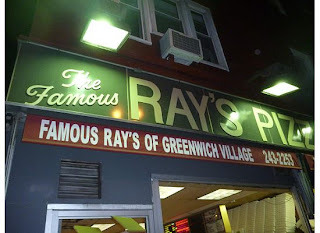 Murray's Bagels. Multi-grain bagel, scooped, nova. No, I do not want cream cheese. 5. Citerlla Rotis Chicken. One of the most affordable things at gourmet supermarket Citarella is also one of the most delicious. We eat their rotisserie chicken over salad for at least 2 meals per week. 6. Steak. We know, we know. The cows in Argentina are grass fed and free roaming and will change your life, blah blah blah. And you can bet Dave will write a long post comparing US and Argentine beef products. But for now, there's nothing better than a NY Strip from Mortons, fed good old American corn and grain and hormones and whatever else, and served perfectly medium rare. When Erica and I are around, Dave and Brian are not permitted to order for 6. 7. Wine and Cheese on the Roof of 45 W 10th Street. It is a horrifying to think that creamy, pungent, oozy cheese will not be available right around the corner from our apartment, and that a lovely rooftop garden with a glorious sunset will not always be available just 4 floors above our apartment. 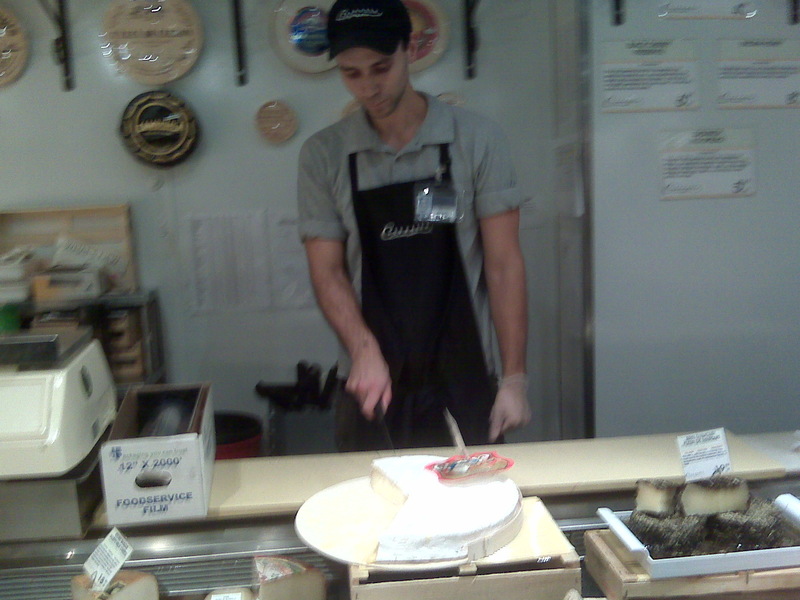 So, we have to give a special shout out to our favorite brie from Citarella. *Excluding the upcoming 12 months of our lives. 8. Sushi. If it weren't for (a) my wallet, (b) my unborn children (and the effect of mercury thereon) and (c) the fact that Dave only wants to eat it after a workout (few and far between these days), I could eat sushi four times a week. Even though I usually get delivery from one of two local places on Seamless, I'll really miss-u Mizu (oh no I did'unt) and the delicious order Sam always places for the table. 9. 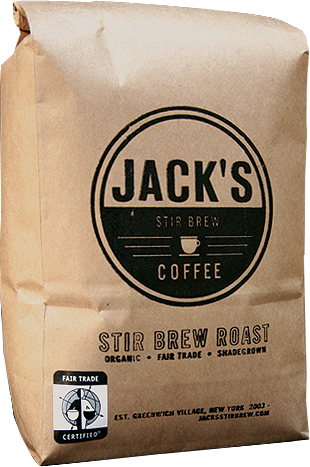 Jack's Stir Brewed Coffee. Dave loves this coffee so much that he insists on buying whole beans rather than ground, so as to keep their flavor extra fresh. Each time he makes coffee he (1) grinds beans, (2) puts Okie* on to boil, (3) places special filter and ground coffee in Chemmy**, (4) fills our travel mugs with boiling water to get them toasty warm, (5) slowly pours other boiling water over the coffee grounds in two 12-ounce increments, making sure to evenly coat all grounds with water, (6) pours milk into a microwave safe glass, heats it up, divides it among our mugs and froths it with special battery powered frothing doodad, (7) adds splenda and (8) pours brewed coffee into the mugs. Needless to say, if Dave is not around I always walk the block and a half to Jack's and buy my coffee in a very convenient one-step process. ** Nickname for Chemex, the most successful birthday gift I have ever bought for Dave (even if he did, upon receiving the Chemex, conduct his own extensive internet research to assure himself that the Chemex was indeed a highly regarded coffee brewing appliance). 10. Chocolate Whipped Cream Cake. Streit family classic. So the question is...If this is not ordering for 6, what would we have needed to add to the table to make this an order for 6? Thank you, that is all. I'll have you know, Brian, that (as our waiter made very clear) each of these steaks are really for just one person.